Artist rendering of the RS-25 engines and boosters powering the liftoff of the 70-metric-ton (77-ton) lift capacity configuration SLS from the pad. Image uploaded March 31, 2014. The engines of NASA's space shuttle will be reborn for the space agency's next-generation rocket, a mega-booster designed to launch humans deeper into space than ever before. The new heavy-lift rocket, called the Space Launch System, will have a core stage expected to stand over 200 feet tall and feature four engines, each capable of 512,000 pounds of thrust. The engine, known as the RS-25, was used on the space shuttle and is extremely reliable, but since the SLS rocket will be heavier, the engines have to be revamped. To do so, scientists have created small models of the RS-25, each one 2 percent the size of the original. NASA recently released a video of the mini rocket engine firing. Engineers will use the models to study the extreme heat the rocket will endure as it climbs into outer space. That information will, in turn, help engineers fine-tune the base thermal-protection system, which shields the rocket's machinery, and astronaut crew, from the fires below. The 2-percent scale models of the SLS boosters and core stage engines are ignited for a 100 millisecond, hot-fire test. Image uploaded March 31, 2014. Engineers created the models specifically so they could be tested in wind tunnels. "Wind tunnel testing is one of the most proven ways to adequately simulate the pressure and heating an actual rocket will experience during ascent," NASA's Manish Mehta, lead engineer for the SLS Base Heating Test Program, said in a statement. "We had to make sure these models achieve aerodynamic and rocket plume similarity with the real flight vehicle, as closely as possible." 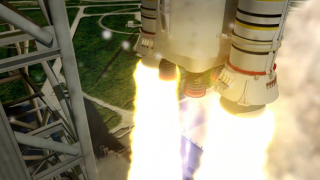 The first test flight of the SLS is expected to happen in 2017. The final SLS will be built to carry 77 tons into orbit and fitted with an Orion spacecraft, NASA's capsule designed to transport astronauts to far-off destinations in the solar system. The SLS will eventually be able to lift 143 tons into space, more than any other rocket, with future target destinations including asteroids and Mars.